On the way back to South Florida from Georgia, we decided to make a pit stop in Saint Augustine to have dinner at one of my parents favorite restaurants, Hooked on Harry’s, a seafood restaurant with a New Orleans influence. The restaurant offers indoor and outdoor seating. The decor is lovely throughout but because I am big on aesthetic and enjoy nature, we sat outside where there was a live performer. The outside patio is quite large, so if you want to enjoy the music but not be so close, you have plenty of options. The patio has trees throughout it and lights dangling through its courtyard. It really is beautiful, and being that you are very close to the water, you might get lucky like I did and have a breezy serene night. I began with a glass of one of my favorite wines, Crush by The Giving Tree (fun fact: this is Dave Mathews’ brand). This wine is a red blend. I haven't gotten around to learning ‘wine lingo’ yet and wouldn't want to send anyone in the wrong direction in trying to describe the taste, so I’ve linked it above so you can take a look and make a decision for yourself. I was pleasantly surprised of the cost per glass; i’ve paid more at regular shmegular restaurants. The menu is diverse in its food/meat options, but fair to keep in mind it is primarily a seafood restaurant. Our meal began with the Crab & Eggplant Napoleon, recommended by the server. Look, I didn't even know I liked eggplant as much as I did until I had this plate. This starter was DIVINE, and I would have it again as a entree. The eggplant is panko crusted (YUM) topped with (REAL) crab meet in a parmesan basil cream sauce. The sauce is very very creamy, so it complimented perfectly with the crunch of the panko. 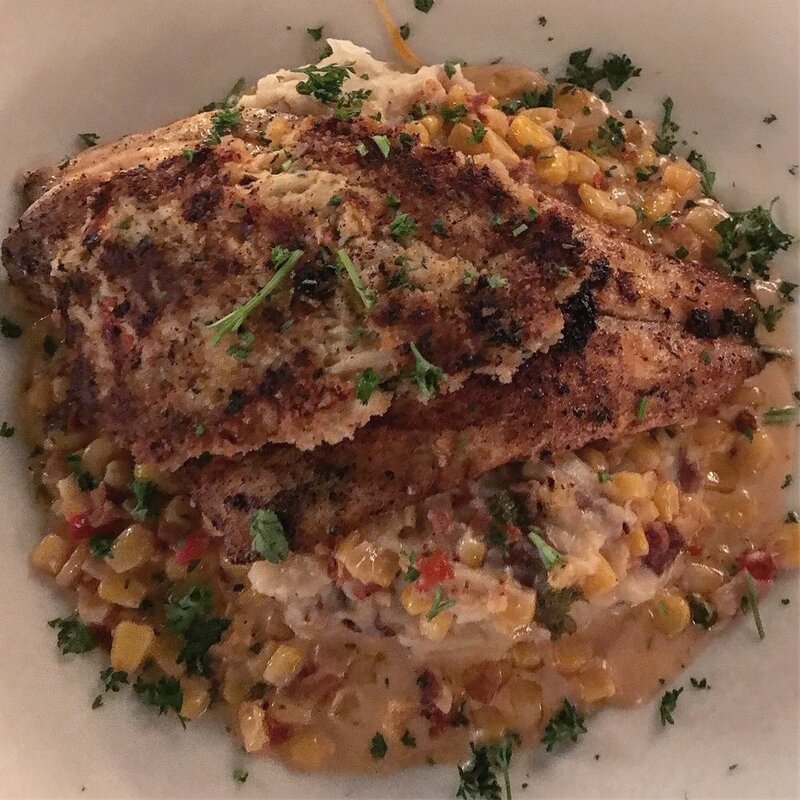 My entree was the Crab Crusted Red Fish Royale: a blackened red fish with crab meat (I was in a mood) with corn maque choux and smashed potatoes, with a Louisiana beurre blanc. In simple terms, beurre blanc is a lemon butter sauce (beurre blanc means white butter in French) very often used in fish dishes. Another creamy flavorful dish with a nice crunch from the corn. The portions are generous, which makes me very happy because the more the merrier. There are several Harry’s locations in North Florida. Unfortunately, none yet in South Florida, but worth mentioning for any one who is in northern Florida or is passing through that area. Nothing on this post was sponsored, paid for, and is in no way an ad. Just personal experience and opinion. Also, I did Hope you enjoy!